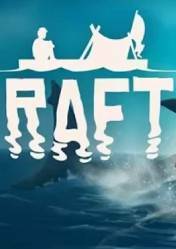 In Raft we'll put ourselves in the shoes of a survivor in the middle of nowhere. An enormous ocean full of dangers and especially of sharks, in which we must survive in the purest shipwrecked style. One of the strong points of Rafting is the possibility of enjoying this new survival adventure in the company of friends. Among our tasks are the collection of all kinds of debris to survive, expanding our raft to escape, creating our house to protect us from the inclemencies of the weather,... Our character will start in a small raft with nothing more than a plastic hook and surrounded by a vast ocean, and practically dying of thirst and hunger. Our first mission will be to find something to put in our mouths, but it won't be easy, the immense blue sea hides dangers we can't even imagine. Resources are hard to come by at sea. We will have to be skilful and catch any floating debris using our hook and, when possible, collect the reefs under the waves. we can build survival kits, weapons, farm plots and more to help us survive. I have played this game more than 1 year ago, didn't even know it released, it's a great game with or without friends, so try it out now, good game! I got this game on winter sale, so it was a bit cheaper. It is very enjoyable to play. Even normal mode is quite a challenge. I also recommend looking things up or starting in creative to figure things out. If you don't know what you are doing you will die pretty quick. The best part of this game is how rewarding it is when you get something done. Great concept, by my only comiplaint is how little is in the game. I really hope they keep updating it frequently, and add more stuff to do. The things that they have now are really good, but it will only last 10-15 hours to master everything if you are going at a solid pace. I hope that anyone who buys it enjoys it just as much as I do, and that the developers keep adding more. This game is amazing. I've played lot of survival games and this one was one of my favorite. I could play this game many hours. I liked a lot of early version before it went on steam. Sure its still in Early access, with many bugs and lacking on some aspects, but it already has most of the things you'd expect on any other survival-type of game out of there, from here on you can only expect the developers to put more things into it (we hope). Its an awesome game to watch but i think itll be cooler if i play it, so im hoping to get it, and i hope my friend gets it too so we can play together! Its light hearted fun with friends.